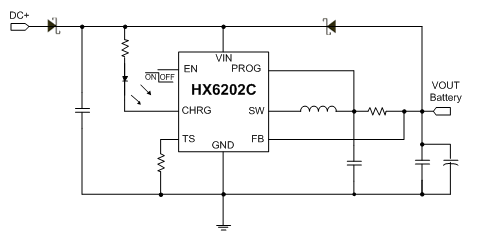 The HX6202C is a complete battery charger controller for one (4.22V) cell lithium-ion battery. The HX6202C provides a small, simple and efficient solution to fast charge Li-ion battery. An external sense resistor sets the charge current with high accuracy. An internal resistor divider and precision reference set the final float voltage to 4.22V per cell with ±1% accuracy. When the input supply is removed, the HX6202C automatically enters a low current sleep mode, dropping the battery drain current to 4µA. After the charge cycle ends, if the battery voltage drops below 4.05V per cell, a new charge cycle will automatically begin. The HX6202C is available in the SOP8/PP package.